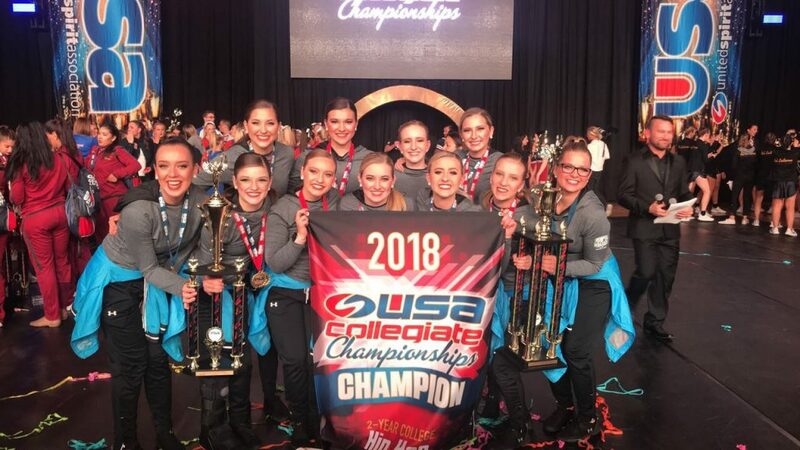 Last weekend, Utah State Eastern’s dance team placed first in hip hop and second in dance at the United Spirit Association’s Collegiate Championship and Collegiate Expo at the Anaheim Convention Center in Anaheim, California. Emmett the Eagle placed second overall in the mascot category. Under the direction of Brandi Taylor Johansen, who is in second year at the helm of Eastern’s Spirit Squad, 15 students from the coed cheer squad and 12 students from the dance team plus the mascot were judged in their respective categories during the two-day competition on Feb. 24-25. The Eagle dancers beat Sacramento City College to take first in the two-year hip-hop dance routine. They also placed second in the two-year college open dance behind Orange Coast College. The routines were judged on choreography, execution and performance. After the awards ceremony, Johansen said, “These beautiful ladies represented their school for the first time in over 20 years. I am truly the luckiest coach to be able to have 12 girls that love what they do, that love and support each other day in and day out, and dedicate so much time and commitment to this team. Emmett the Eagle faced competition from both two- and four-year colleges. The top mascot was Buster the Bronco from Boise State University. Emmett placed second for his skit about competing in numerous sports at the Olympics. This was the first time a mascot had represented Eastern at a spirit competition. “Emmett competed in an interactive skit that caught the eye of judges and Varsity reps. They featured Emmett on their webpage, complete with an article about him. “Without revealing Emmett’s identity, I want everyone to know that this student is one of the hardest working students on campus who is humble, smart and kind,” Johansen said. It was a last-minute decision to bring Emmett to the competition. Johansen said, “taking second at nationals says more about the student behind the mask than anything.” She thanks Brent Innes, Eastern theatre associate professor; Diana Root, aerobics instructor and C & E Custom T’s for helping build the creative props. The cheer squad competed against Mount San Antonio College, North Idaho College and Snow College. They were judged on composition/choreography, technique/execution, dance, showmanship and the image/performance of the team. They are coached by Kelly Bradley. The dancers include Madison Burrola, Hailey Burningham, Carson Enlow, Jalyssa Friant, Samantha Hall, Rylee Hussey, Mikaela Jensen, Shaylee Jensen, Collette McElprang, Rilee Jones, Dakota Noyes and Chloe Teuscher. The cheer quad included Marisa Bradly, Sylvie Call, Payton Carlson, Kelley Dean, Danielle Fitch, Melissa Fossat, Jasalene Hackwwell, Kori Jorgensen, Maegan Mower, Addison Murphy, Tasha White, Christian Heugly, Zach Morrell, Isaiah White and Kiana Elias.